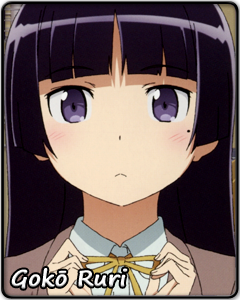 Gokō Ruri, better known under her alias Kuroneko, is a top-class representative of otaku aristocracy. A far cry from the bespectacled and sweaty stereotypical otaku, Kuroneko believes that extreme indulgence in a hobby does not lift the obligation to maintain a high standard of personal conduct. She goes to great lengths to maintain an air of dignity and sophistication. She seeks excitement only in the highbrow aspects of her hobby. It would therefore save her a lot of trouble, and embarrassment, if the people around her did not misunderstand her character. Just because she spends her free time with a group of simple-minded individuals, it does not mean she likes them. If she puts on cat ear accessories, it is for experimental purposes only – why would she hold any interest in such things? Kuroneko's acquaintances always manage to find her with the worst possible timing, putting her ability to keep up appearances and make up excuses to the test. Put first impressions aside, though, and you will discover that Kuroneko hides a gentle heart. She is merely careful about lowering her guard and showing her affection. When necessary, Kuroneko readily stands to her friends' aid, even if she has to sacrifice her pride in the process. But when everything is over with, she will never admit how hard she worked for them. Not everything needs to be put into words, right?